Years ago, my wife and I sat down in the Brown Hotel in Louisville, Kentucky, to taste some bourbon with Joe Castro, who was the chef at the time. At one point he grinned mischievously, excused himself, and returned with a small flask of white dog from a major distiller tucked under his arm. White dog is what distillers call whiskey when it comes off the still, but before it goes into the barrel. It is, in other words, raw whiskey, without the mellow flavors and rich hue that the barrel brings. It is as clear as water and if it is destined for the barrel, as opposed to the bottle, is strong. I’d toured a few distilleries, and I’d had the occasional sip off the production line, but I’d never tasted professionally distilled white whiskey in a glass, side by side with what it would eventually become. What I saw was the progression from the raw spirit to the cooked. The charred oak of the barrels gives flavor--vanilla, caramel--and takes away the hotter flavors, but at the core of whiskey remains the flavor of the white dog. I named my book about moonshine and small scale distilling Chasing the White Dog. It came out in February 2010, and I think my timing was good: It’s been 200 years since this much white dog has been on the shelf. White dog is hot. At the fantastic Sorrento Hotel in Seattle, I poured drinks with Christian Krogstad, one of the owners of House Spirits. (In all fairness, he did most of shaking and pouring and I did most of the speechifying and joking around behind the bar.) We made a version of the white manhattan which we called the Willis. It was simple: House Spirits Rye White Dog, blanc vermouth, and a blend of Fees and Regan’s orange bitters. At Nopa in San Francisco, Neyah White uses Death’s Door white whiskey and adds a little Benedictine. In the Columbia Room in Washington D.C., Derek Brown uses white rye from Copper Fox, replaces the Benedictine with apricot brandy, and adds a dash of Laphroaig. They are all delicious. The white manhattan has been mentioned quite a bit in the press, and has become the de facto white whiskey drink. 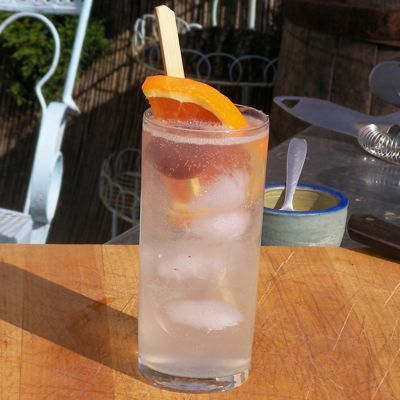 As the mercury climbed for the first time this year my thoughts turned to bubbles and citrus and tall, refreshing, icy drinks like the Tom Collins. I remembered that we also poured a drink we called the Jack Collins, made with white whiskey. This cocktail highlights the flavor profile of white whiskey in a very special way. I love a whiskey sour, for instance, but there’s often a strange clash between the round, vanilla and caramel flavors of the oaked whiskey and the sharp, clean zing of the sugary citrus. White whiskey plays along perfectly. Luckily, I’d recently acquired a bottle of Buffalo Trace white dog -- the same white dog that goes into a barrel and eventually becomes George T. Stagg bourbon. Perfect. Buffalo Trace’s white dog is from Mash #1, a corn heavy bourbon mash. It is surprising, brilliant, and clean. In the cocktail the corn sweetness came through, and the grainy character remained. At 125 proof, it’s very strong. It’s surprisingly drinkable even at full strength, but be forewarned and pour lightly if it’s the white whiskey you choose for your cocktails. optional garnishes: brandy macerated cherry, orange slice. Shake white whiskey, lemon juice, and sugar in an iced cocktail shaker and strain into a tall glass filled with ice. Top with soda water, stir once. Garnish, if you like.